I have finished my Rainbow Pixel Heart in a Pixel Heart Quilt! I love it! It turned out to be quite a bit harder than I thought it would be putting it together. I am not the greatest at doing puzzles so it took quite some time to lay it out. Then a small tragedy struck when my 2-and-a-half-year-old dragged her jacket through my quilt layout and I had to re-do it. It turned out alright in the end though. This post contains affiliate links. For more on affiliate links please see my “About” page. This quilt is made with my Pixel Heart in a Pixel Heart pattern. 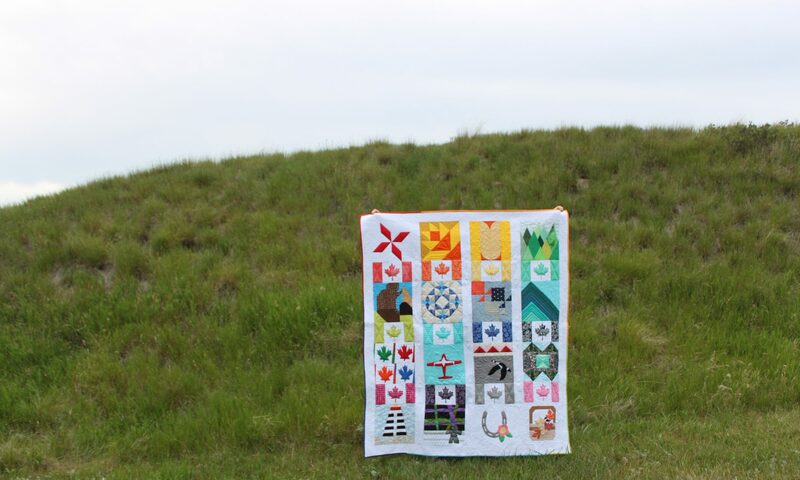 The pattern includes a colouring page so you can figure out a rainbow quilt layout like this too. I made this quilt with Craftsy’s Boundless Blenders in Ombre. I am very pleased with these fabrics and am going to order more because this quilt has already sold! I first told you about the Ombre Blenders in this post. I haven’t used them all up yet but I am ordering more as soon as I can. 🙂 They are fun to photograph too. I quilted the small heart with crosshatches because even though I used the lightest part of the ombre fabrics for the small heart and the darkest parts for the large heart I wanted to make that small heart stand out a bit more. I quilted the large heart with vertical lines on either side of the seams. Then I quited the background which is Kona Snow, Kona White, Kona Seafoam and a Kona Tan with stippling. How I’m off to pack it up and send it to it’s new owner! 🙂 Have a happy rainbow kind of day! Beautiful quilt. It's new owner will cherish it. ? ?